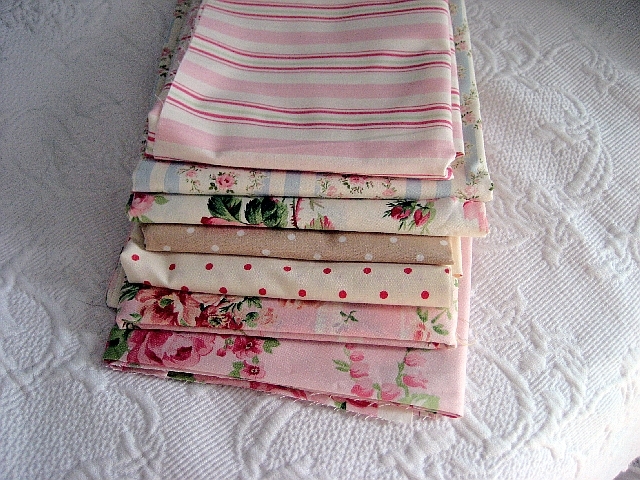 I have a new stack of fabrics in my studio that are just the yummiest pinks and roses. These luscious fabrics are some of the Barefoot Roses line from Grand Revival Design. Pop on over to Tanya’s blog and see all the wonderful things she is working on for this line of fabrics that she has designed. I was inspired to created an apron for my Etsy shop. I plan on using up all this fabric on creations for the shop. Maybe more aprons or a tote next. These beautiful fabrics also combine very well with some of my vintage textiles. Maybe that is where I will go with these next. Mix and match with some yummy satin brocades, oh yeah! 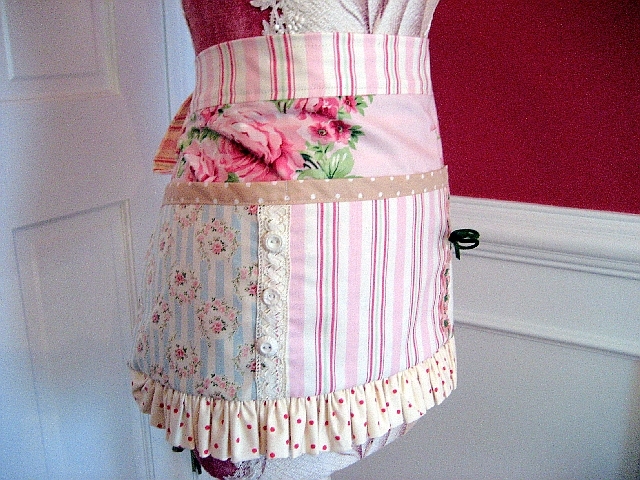 Love the apron, especially love how the ruffle is in the back! Absolutely beautiful Suzy!! Love it, thanks for making the fabric look so fabulous and for the shout out! Yes, I think those will tie in beautifully with your vintage prints. The apron is so dreamy, I just love it! Hi Suzy, I looooove that wonderful apron! I am your partner for Debs black cat n Pumkin swap! I would love to know what you like and don’t like! Whats you style…. spooky, cutsey or vintage halloween! Belated HB! And I love the new apron. Glad to hear your pack arrived in good condition! I have a really good reason for not being online for a while. But I won’t share here. Wow, that’s georgous. You did a great job. wtg..I just love the materials you picked out and the design. WOW ! What a CUTE apron!!! LOVE IT !!! Love the apron and the way you combined the fabrics! Just lovely. And i also am in love with your banner! I love vintage buttons. So adorable! LOVE the buttons and lace you added! Oh THIS apron IS GORGEOUS!